I don’t have time to write here often enough.. but this topic has been bubbling for awhile now. It’s a sunny Saturday so will finally take quick shot below, you might wanna grab some coffee! There’s plenty of chatter about the global startup scene along with so-called ‘innovation’ opportunities and many challenges faced by players at all levels in that space. It would be easy to pepper this with a gazillion links to material describing how Japan is risk-adverse and/or has no VC base to build next-gen. companies.. bla-bla-bla. Such simplistic points, seldom well balanced, need another post to counter with a wave of my magic reality wand. No, the tight focus today is two-fold: we are headed into a “Startup Renaissance” in Japan and, therefore, considering carefully near to mid-term road ahead with that being the case. There are literally dozens of big Japanese brands, from Canon to Yamaha, that began long ago with a couple of inspired people in a workshop, more interesting – read: important but usually missed – would be the thousands of companies that are +200 years old. The Valley mantra is Fail Fast.. however, Plan Well is usual procedure here, kindly suggest the hybrid “Plan Well – Fast” as ideal method, keeping in mind Kaizen is long baked into the domestic approach with seeds planted from overseas. There’s plenty of startup history, Built to Last. The latest digital economy has enabled significant new offerings from around the world and, whether H/S’ware, tremendous growth for Japanese ICT related fields. A deeper dive topic for any MBA thesis, carefully noting DVD and Ruby on Rails, this ‘business chance’ is certainly now established. My point with those two examples would be that whether it’s via old school corporate, or by relatively un-known individual source, these born in Japan products – along with so.many.others – have demonstrated impact globally.. and not ‘just’ in IT verticals. While it may be difficult for some to fully grasp, the Island Spirit – Shimaguni Konjo – is very strong here. Designing and running a best-of-breed community model goes right to the core of Japan. This new world order, or New Normal as I’ve stated in these post 3.11 times, has opened the window for some fresh air. The future potential is tangible. While parents and grandparents spent their lives pulling this country from ruins of 1945, the current task for those who follow will be pushing such incredible efforts to the next level. I believe they have the passion, skill and resources to build on that foundation. Go ahead, underestimate them. “I’d like to turn Japan into an ‘entrepreneur powerhouse’..” Prime Minister Shinzo Abe. Every viable ecosystem intrinsically addresses the demonstrated need by re-distributing collective value across the group. No single entity holds all the cards. Thankfully there are local icons who have blazed that trail here, from Namba-san, to Son, Natsuno, Tanaka and hundreds more, with exciting recent promise by Idei-san to launch his World Innovation Lab**. We see amazing talent and energy in the universities, advanced patent power continues at Yokosuka Research Park, while in the trenches affordable open platforms are driving real action along with more support from both public & private domestic sources. It’s Happening. **Jan. 27th, 2014 – It’s Official. Ok, with the stage set above in mind, now what.. so many pieces in the puzzle. We have been at the crossroads of corporate and startup, local and global, since 2001 – certain some potential to contribute going forward. Over the coming years it’s a safe bet we’ll see increased interest in Japan, not just because of Tokyo 2020 Summer Games, combined with an ever growing awareness and desire for business overseas by domestic SME’s. Considering our network of contacts and multi-market experience clearly we can fill some of the usual gaps. One key lesson learned over our time here is the very real power of bringing people together, actually in the same room, under a brand agnostic umbrella. Regardless of their background, current position or nationality, each one has a wonderful blend of standard requirements and unique offerings to embrace. While this can be an awkward (Jr. High school) dance, at first, but that safe ‘friends and family’ sandbox enables f2f encounters that does lead to deal flow. We took an important first step in that direction on 11.27th with our Tokyo Startups United event. 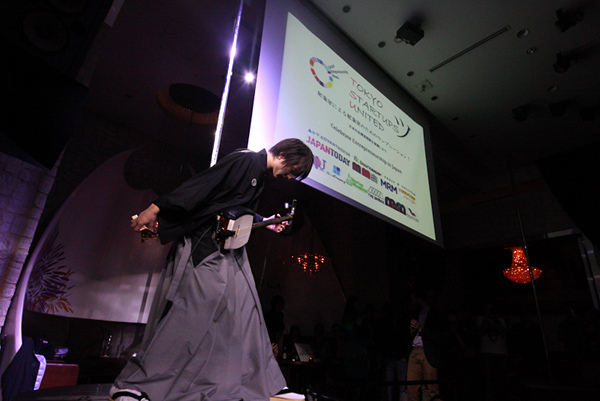 Blessed by a Rock & Roll Shamisen and 300+ people attending, 50/50 domestic vs. international and titles across the spectrum, that room was Really buzzing! (photos here). Expect to see further efforts like this in 2014 and beyond as we explore, together with trusted partners, how best to participate in developing a most valuable and beneficial platform for all.